I've been asked by a few people how I would go about getting a bass sound, since I mentioned that I'd approach things differently from the way Yossi Fine did in my recent Getting A Bass Sound In The Box post. Actually, the sound of the bass isn't as important as the relationship it has with the kick and snare drums, since they all reinforce one another if blended correctly. Here's my approach, assuming that both the bass and the drums are recorded well and sound pretty good to begin with, which is key. 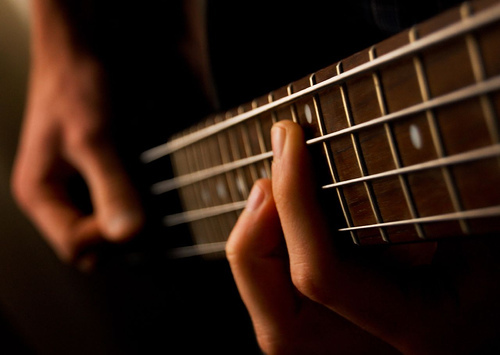 1) Bring up the bass and drums together and have a listen to how they work together first. Don't solo anything and especially don't solo, then reach for the EQ just yet. Just listen to see what's needed. 2) It's usually a good idea to take the high pass filter and set it to about 40Hz (maybe a bit lower, depending upon the Q of the filter) on the kick and maybe as high as 50Hz on the bass to get rid of any of the unwanted and unneeded frequencies down below that get in the way. You'd be surprised how much this one trick cleans things up. 3) While listening to both the bass and the drums, add some low end on the kick between 60 and 80Hz if needed. Some kicks also require a small (2-3dB) dip at somewhere between 400 and 800Hz. To add some definition, boost a little between 3 and 5kHz, but realize that whatever you do here might get in the way of the vocal. 4) The bass usually speaks best if any low end added is about an octave above the kick, so if the kick was EQ'd at 60Hz, then try boosting at 120Hz first. Keep in mind that it might sound better at 100 or 150Hz instead, depending upon the instrument, the song, the arrangement and the player, so try all those frequencies before you settle on one. Remember that you should be listening to the drums at the same time you're EQing the bass. One of the problems that inexperienced mixers have is that they boost the very low frequencies (40-60Hz) of the bass first, which only muddies things up and makes it disappear on small speakers. A solid round low end with better definition usually comes from 100Hz upward. 5) For more definition on the bass, add a little 700Hz or so, or at the exact frequency that you dipped the kick drum. 6) For some snap or buzz, add some 1 to 3kHz on the bass. 7) Make sure than any frequencies that you boost on the snare haven't already been boosted on the kick and bass. 125Hz gives it some bottom, but if the bass is already boosted there you have to go a little higher or lower (usually higher) to make it fit. Add some 1 to 2kHz for attack and 10kHz for some snap. 8) Sometimes it sounds better on a song if the frequencies of the kick and bass are reversed, with the bass getting boosted at 50 to 60Hz and the kick an octave or so above it. A little juggling of these frequencies should give you a great drum and bass blend. You can find a lot more on recording and mixing bass and drum sounds in The Mixing Engineer's Handbook and The Recording Engineer's Handbook. I just read a great article about how the famous Bell Labs, the R&D arm of the original phone company, actually came up with multiple innovations way back in the 30's that could've started the information age some 50 years earlier than it actually did. The story goes that in 1934, Bell Labs engineer Clarence Hickman created a phone answering machine that used magnetic tape. Now keep in mind that the first known development of magnetic tape recording was 1935 by BASF, which was kept secret so it could be used by the German war machine. German tape recorders were only discovered by the Allies at the end of World War II. It wasn't until the late 40's that magnetic tape recorders became a commercial product (thanks to, of all people, Bing Crosby and his considerable financial resources) and it wasn't used for computer storage until the early 50's. The first viable tape answering machine came on the market in 1971. So if Hickman invented a magnetic tape recorder before anyone else, why haven't we heard about it until now. Because Ma Bell, the phone company monopoly, killed it, afraid that such an innovation would hurt their business instead of help it. The execs at the company did such a good job of suppressing Hickman's creation that it wasn't found for 60 years, and only then by a Bell Labs historian. Imagine what could've been if only the company had been less paranoid. Modern recording technology could've had a head start by at least a decade, if not more. Here's a video that shows an interesting technique for getting a bass sound while mixing in the box. It's a Waves promo piece, but it has an different take on how to make the bass sound bigger and more distinct. I personally would probably approach it differently, but it's good to keep an open mind. It used to be that the sound of a DAW was dictated by the kind of A/D and D/A convertors you used, so much so that studios and engineers went to great lengths to buy the best, highest end units they could find. But as the years have gone by, prices of expensive chip sets used in converters have dropped so much that even the cheapest now uses almost the same components as the current best, which results in about the same sound quality. This was recently perfectly illustrated in a shootout conducted by the excellent UK magazine, Sound On Sound, where they compared the new Avid HD Omni, and original Digidesign 192 IO, a Prism Sound ADA-8XR and a new Apogee Symphony I/O in a blind test. 1) the sound of your system is culmination of your entire signal chain, not just the converters. Certain gear plays nice better with certain gear than other gear, which means that one unit might just sound better than anything else. 2) the feature set of each unit has now become more important than the sound quality, if they're all pretty much in the same audio quality ballpark. 3) you can still use the same components in different interfaces, but the way they're used can make a big difference. For instance, a bigger, better designed power supply with allow the unit to provide more headroom before distortion. 4) converters might not mean that much to your setup if you're mixing in the box. Ten years ago convertors made a huge difference; today not as much. For once, quality gets better as time marches on. Read the entire Sound On Sound article here. This isolated vocal track from the Rolling Stone's great "Gimme Shelter" just came to light recently on the Dangerous Minds blog and it's a mindblower. On it we hear Mick Jagger, Mary Clayton and an uncredited third voice singing the song like you've probably never heard it before. Here are a few things I noticed. 1) What jumps out is how thick and long the reverb on the vocal track is. The verb is delayed so it stays out of way of the lead vocal a bit, but there's a lot more of it than I ever remember hearing on the record. 2) The other thing that jumps out is the third harmony vocal on the choruses in between Mick's lead vocal and Mary's high part. Never heard that before, but I like it. 3) It's interesting to hear how distorted everything is, especially on Mary Clayton's parts when she begins to belt it out. 4) Mary Clayton's part in the bridge is still great, no matter how many times I've heard it before. What a performance. Gives me chills! UPDATE: Sorry, but this video has been removed due to a copyright claim by ABKCO.